Stocks are among the most basic preparations found in any kitchen. In fact, they are referred to in French as fonds de cuisine, or the foundation of cooking. Stocks are made by gently simmering meaty bones, trim, and/or vegetables in a liquid to extract their flavor, aroma, color, body, and nutritive value. 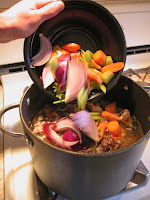 The liquid is then used to prepare sauces, soups, stews, and braises and as a cooking medium for vegetables and grains. 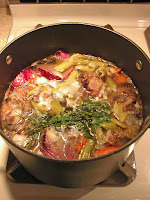 Especially in the colder months, we are using more and more stocks as the base liquid in soups, stews, and braises. As you can see by the definition above, stocks are used for many preparations. And in my book, you can never have enough stock. I know you can buy a can of stock at the store, and I do sometimes, but try making some homemade and see if you can't tell the difference! Many of my recipes will include some sort of stock so I thought I'd define what I mean when I call for it, and explain how it is made. A good homemade stock is like liquid gold! Stocks are not difficult to make, but they are somewhat time consuming. Start with cool water and bring to a gentle simmer over low heat to gently extract the flavor from the bones. Make sure and monitor the temperature, you should never find the stock boiling. The low heat will help to keep the stock clear. Aside from the aesthetics of a clear stock, as opposed to a cloudy one, the impurities that leave the stock cloudy are the same elements that will quickly spoil and sour a stock. The clearer the stock, the longer its shelf life. 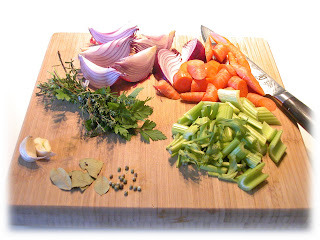 To add body and to give the stock a more full and balanced taste you will be adding some vegetables (usually onion, carrots, and celery, known as mirepoix). These vegetables should be roughly chopped and added about an hour before the cooking is over. Adding the vegetables at this point will allow enough time for the best flavor to be extracted but not so much time that the flavor is broken down and destroyed. When to add the aromatics also depends on how fine or large they were cut. Probably the best way to tell when a stock is done is to taste it. But here are some approximate guidelines you can use. I'm going to break this process down into several steps and if you follow along, you really can't go wrong. Put whatever bones and trimmings you have into a stockpot (or a saucepan if you don't have a whole lot), and add cool water until just covered. Over low heat, bring to a gentle simmer. Maintain a gentle simmer throughout the whole cooking time, skimming (see below) off any foam and scum that accumulates on to p.
Add the chopped vegetables into the stock an hour before the cooking is done (do not stir them in, just dump them in. If they are not all covered by water press them down with a spoon or the skimmer. Never stir the stock). Add the bay leaves (2 -3), peppercorns (8 - 10), and 1 or 2 garlic cloves. Continue to cook for another 30 minutes then add the bouquet garni. Cook for another 30 minutes then carefully strain the stock through a fine mesh sieve or cheesecloth. Chill the stock. After about 12 hours in the fridge it should gel up. this is a very good thing. If you made a big batch (which I would recommend if you have the ingredients), you can store it in ziploc bags in the freezer. 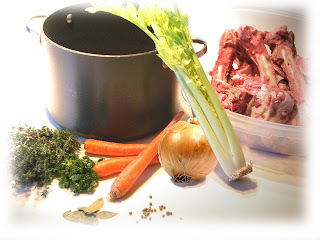 I would advise you to make some stock to be ready for next week's lamb stew recipe! Obviously, one of the major uses for a stockpot is for making stocks. Stockpots are usually taller than they are are wide, this allow s for less evaporation. Anodized aluminum and stainless steal are the preferred materials. 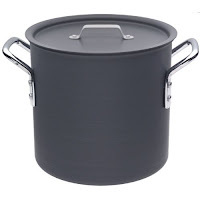 Stockpots are very useful for other kitchen preparations as well. We use them for soups, stews, making rice, and boiling pasta. Stockpots come in various sizes from 4 quart to 18 quart and bigger. This is one of the most useful tools in a kitchen. It can be used for anything from skimming, to sifting, to straining, to scooping out blanched vegetables. For the stocks, it can be used to skim off the fat and scum that accumulates on the surface. It also works to strain the stock when it's done. This is a good one...Calphalon Stainless Skimmer.